Cyclesnack: Nothing beats riding in the fall! 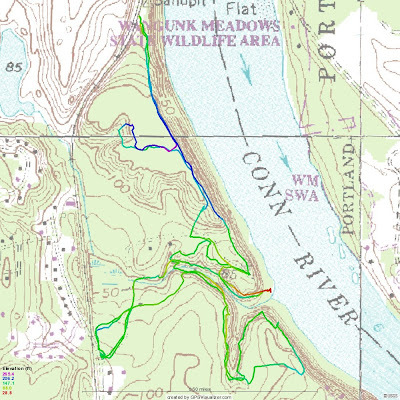 CT NEMBA held a meeting ride at Blow-Hole State Park; aka River Highlands SP; aka Cromwell Creek. I think it has been two years since I last rode here. Getting back on the bike after a day off from riding the Tour de Roxbury on Sunday felt especially wonderful. I know I bailed after 4 hours of riding but I wasn't the slightest bit tired and could have gone for more! I wonder if the VT50 is in my future? Definitely the D2R2! Between the two rides, I would say I have ridden three quarters of the trails. 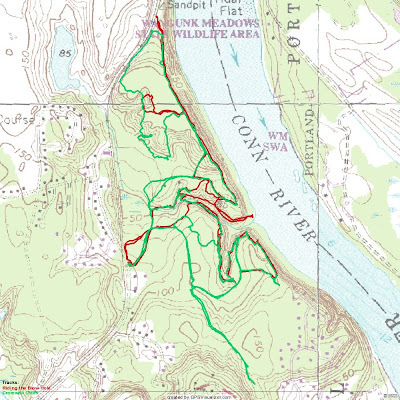 This is a great place, 177 acres with scenic overlooks, 150 feet above the Connecticut River. The State Map shows many more trails to which you might be able to get a 10 mile ride out of this place if you were to ride all the trails. Al Tinit brought his Zion 29er 1x9, that if you click on the picture and look closely at the bash ring you might notice a few missing chain ring bolts. He forgot them when he was building up the bike but rode fine. Glenn brought his Monocog, which is rigid and SS. That man is a machine on that bike. I pre-hyrdated by drinking two diluted bottles of sport drink and found with the cooler weather I was never thirsty. Not once did I take a sip from my hydration pack and it was pretty full. I am so used to it though that I barely noticed the weight of it's presence. Art was there too. Except Al and myself everyone else was wearing their CT NEMBA Trail Ambassador Jackets. It was a Trail Ambassador Fest. The views from the ridge overlooking the CT River are spectacular. Here is shot of me from the Blow-Hole, the rivers edge. For more pictures from the ride, head over to the New England Mountain Bike Association, CT Chapter Blog. I wish I brought the Qball because this place is perfect for riding rigid but I am not happy with the cockpit on the bike. I am thinking about trying real Cyclocross Drops and getting Cane Creek Drop V levers for the Hartford Cyclocross event in two weeks. You ride down those scary steeps? it's funny, because the place is really chill except for that. Well, I suppose there are those dilapidated ladders and things ten feet off the ground, but I wonder if those were ever usable. All those stunts have long since rotted away. There are still a few foot bridges in the main canyon that are in good shape and there is one up and over that is fine but everything else is toast.